Let’s talk beef jerky. Who doesn’t love a good delicious protein snack when camping, hunting, hiking, or perfect for game day? 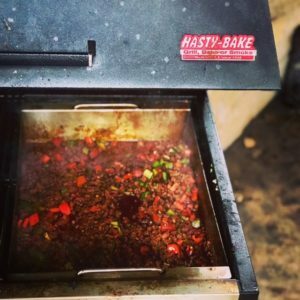 Give your jerky an authentic smoke flavor on a Hasty-Bake Charcoal Grill. Beef jerky can last a long time being refrigerated since it has been cured and smoked. 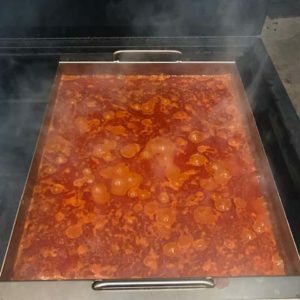 Take all of the dry ingredients (above) and the Hasty-Bake barbecue sauce and mix together in a bowl. Take the remaining ingredients and mix up in bowl. Now, add the sliced meat to the mixture in mixing bowl. Use a zip lock bag to keep the meat fully immersed in the mix to allow it to cure inside the refrigerator for 24-36 hours. Prepared the Hasty Bake Charcoal Grill with a small amount of charcoal the size of a large grapefruit and 3-4 pieces of wood of your choice (preference). Make sure to keep the cooking temperature below 200 Degrees F. Ideal temperature would be 150 Degrees F.
Remove the slices from the zip lock bag and lay the slices onto a paper towel to blocked them dry. Add a light coating of Hasty-Bake Rub N Spice seasoning. Place the slices horizontally on the Hasty-Bake Charcoal Grill. Use a small amount of bacon grease and brush on the slices after you have smoked them for 20 or 30 minutes to help keep them from drying out. Flip the meat slices and baste again with bacon grease. Check internal temp with an instant-read meat thermometer to read 165°. Once the beef jerky slices have reached that internal temperature, removed from the grill onto plate. Let the beef jerky cool first, then you’re ready to enjoy! 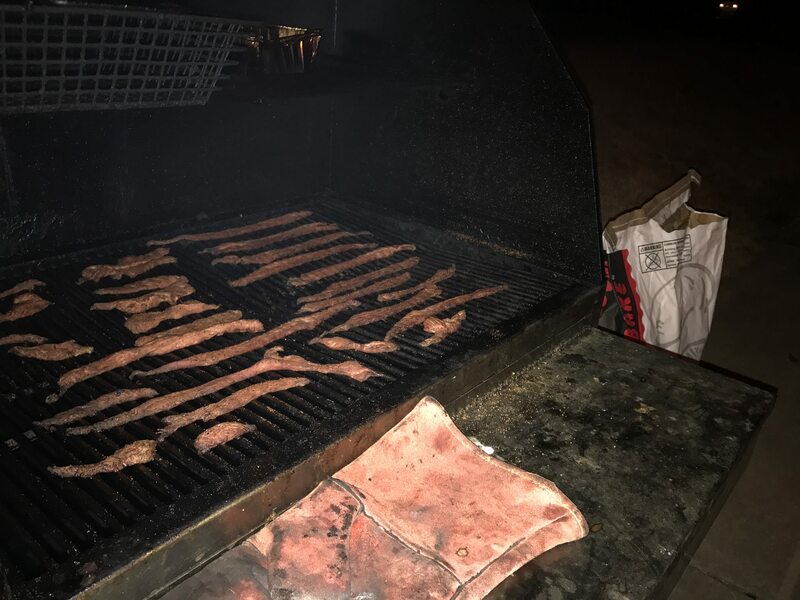 1.Slice and trimmed the beef or venison jerky into strips 2.Take all of the dry ingredients (above) and the Hasty-Bake barbecue sauce and mix together in a bowl. 3.Take the remaining ingredients and mix up in bowl. 4.Now, add the sliced meat to the mixture in mixing bowl. 5.Use a ziplock bag to keep the meat fully immersed in the mix to allow it to cure inside the refrigerator for 24-36 hours. 6.Prepared the Hasty Bake Charcoal Grill with a small amount of charcoal the size of a large grapefruit and 3-4 pieces of wood of your choice (preference). 7.Make sure to keep the cooking temperature below 200 Degrees F. Ideal temperature would be 150 Degrees F. 8.Remove the slices from the zip lock bag and lay the slices onto a paper towel to blocked them dry. 9.Add a light coating of Hasty-Bake Rub N Spice seasoning. 10.Place the slices horizontally on the Hasty-Bake Charcoal Grill. 11.Use a small amount of bacon grease and brush on the slices after you have smoked them for 20 or 30 minutes to help keep them from drying out. 12Flip the meat slices and baste again with bacon grease. 13.Check internal temp with an instant-read meat thermometer to read 165°. Once the beef jerky slices have reached that internal temperature, removed from the grill onto plate. 14. 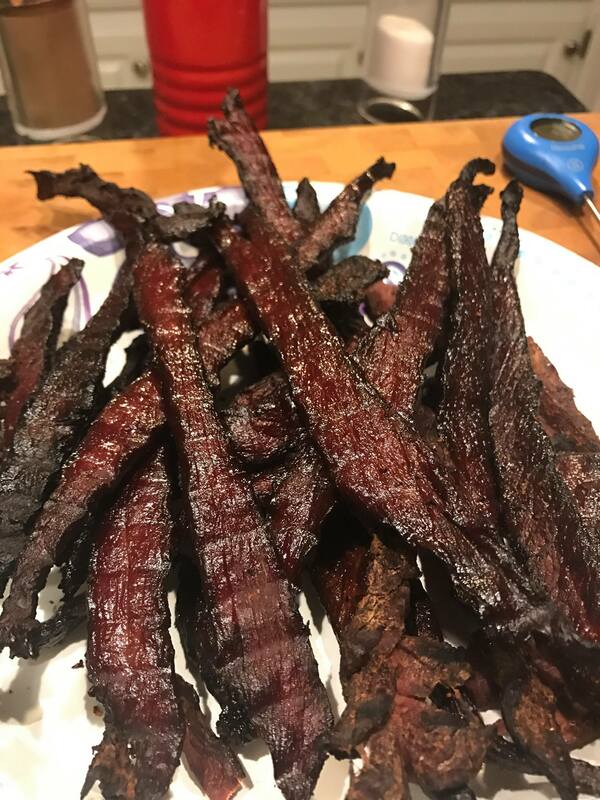 Let the beef jerky cool first, then you’re ready to enjoy!